Pay your HOA dues online! ALL residents who wish to be listed in the 2019-2020 Phone Directory MUST submit a new form (page 19 of the April Highlights). No previous information from old directories will be brought forward. Share & Wear is NOT CLOSING!!!!! dispel the rumor that Share and Wear is closing! Changes are coming to Share and Wear, and we’re definitely refining some aspects but we’re NOT CLOSING! Mondays, Tuesdays, Wednesdays & Thursdays from 11-2 p.m.
And as of October 1, Oceana residents and guests of Oceana residents will be welcome, but non-residents will only be able to shop at Share and Wear accompanied by an Oceana resident. Unfortunately, this is due to ADA restrictions, which we are compelled to abide by. Guests of Oceana residents must be accompanied BY Oceana residents. ***BUT here’s the good news! EVERY First SATURDAY of the month will be “SUPER SATURDAY” which means everything is 50% off (except jewelry) and the public is welcome! For those of you who work weekdays, the FIRST SATURDAY will be YOUR day to come shop our styles at the Boutique and find your treasures at the Annex! We even provide you with BAGS, unlike other California retailers, so NO NEED to drag the bags down! ALL the wonderful activities here at Oceana are what makes OUR Oceana special and unique… do you realize that? We have over 40+ activities: clubs, meet ups, parties, off site events, get-togethers…. No other affordable retirement community offers this much to their residents, and you know WHY? Because of YOUR donations and purchases at SHARE & WEAR!!!!!! You probably do not realize how many hundreds of dollars Share & Wear nets Oceana in order to fund EVERY activity we have here, did you?!! Well, the loss of revenue would cause a tsunami for us, so COME ON DOWN – donate and DEFINITELY SPEND 💰🏃!!!! You’ll be donating to YOURSELF and your community at the same time. AND, did we mention that we’ll be open to the public EVERY FIRST SATURDAY OF THE MONTH?! Spread the word like wildfire! 💨💥We have some of the BEST merchandise around!!! Come see!!! Come take advantage of what THIS OCEANA offers, and be a part of the solution to keep the variety of what we DO offer GOING by your donations and purchases! We need EACH OF YOU to make Share & Wear a continuing success!! Pickleball meets every Monday and Tuesday at 2pm in the auditorium for Open Play for ALL skill levels. Additional Open Play is available, also in the auditorium, at 1:45pm Fridays and 1pm Saturdays. The Friday and Saturday times are new. Until more people realize these times are available there may or may not be enough players. Tuesday mornings at 9am are reserved for Advanced Players. Please use your own judgement as to whether you are ready to join this group. Private Games with friends of your choice may be held any time Open Play is not scheduled and the court is available. Court time may be reserved on the clipboard in the pickleball gear box. Remember, if two parties arrive to play at the same time, the party with the reservation gets the court. If you would like to schedule a standing private game (same time every week) please contact Steve Reigle. NO PLAYER WILL BE ALLOWED TO PLAY WITHOUT FIRST HAVING SIGNED AN OCEANA LIABILITY WAIVER. ALSO, COURT-TYPE SHOES (GOOD GRIP) ARE REQUIRED. WITHOUT GOOD SHOES AND A SIGNED WAIVER YOU DO NOT PLAY. 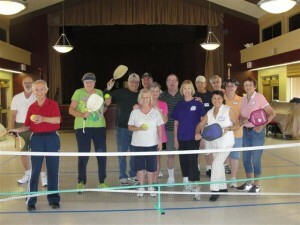 Visit the Pickleball page for ongoing information. Do you have an Oceana friend or neighbor who will need help evacuating in case of emergency? Please click here for information on how to make us aware of their need.